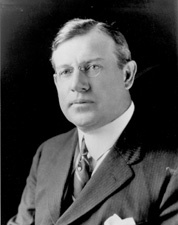 EDGE, Walter Evans, a Senator from New Jersey; born in Philadelphia, Pa., November 20, 1873; moved with his parents to Pleasantville, N.J., in 1877; attended the public schools; employed in a printing office in Atlantic City, N.J., 1890-1894; newspaper owner and publisher; journal clerk of the State senate 1897-1899; during the Spanish-American War served as a second lieutenant; secretary of the State senate 1901-1904; member, State house of assembly 1910; member, State senate 1911-1916, serving as president in 1915; Governor of New Jersey 1917-1919, when he resigned, having been elected United States Senator; elected as a Republican to the United States Senate in 1918; reelected in 1924 and served from March 4, 1919, until his resignation on November 21, 1929, to accept a diplomatic post; chairman, Committee on Coast and Insular Survey (Sixty-sixth Congress), Committee on Interoceanic Canals (Sixty-seventh through Seventy-first Congresses), Committee on Post Office and Post Roads (Sixty-eighth Congress); appointed Ambassador to France by President Herbert Hoover 1929-1933; again Governor of New Jersey 1944-1947; died in New York City, October 29, 1956; interment in Northwood Cemetery, Downingtown, Pa. Dictionary of American Biography; Edge, Walter. A Jerseymans Journal, Fifty Years of American Business and Politics. Princeton: Princeton University Press, 1948; Levering, Ralph B. Partisanship, Ideology, and Attitudes toward Woodrow Wilson: New Jerseys Republican Senators and the League of Nations Controversy, 1918-1920." New Jersey History 109 (Fall/Winter 1991): 1-13.